New pictures of the GE/Freightliner Class 70 have been released. THE INTRODUCTION OF the new General Electric Class 70 ‘Powerhaul’ locomotives for Freightliner will also see a radically revised colour scheme and branding debut on the new machines. Pictures of the newly painted locos have been released by Freightliner and they are reproduced here. • News: National Express drops it Class 90+Mk. 3 train plan for the ECML and joins several other TOCs all bidding to secure redundant Class 180 DMUs. Hull Trains, Grand Central and NXEC all plan service expansion and Wrexham & Shropshire services begin running. The DfT reveals plans for expanded ‘Pendolino’ fleet and 1,100 new EMU vehicles for Thameslink. • Feature: Retrospectrum returns with a detailed look at the Railfreight Metals sub-sector livery complete with a history, full loco listing and some stunning images. • Columns: Your favourite monthly reading – Railtours, Traction & Rolling Stock, Unitary Authority, Irish Angle, complete with superb supporting photography. There is a big surprise as DRS is to return 10 Class 66/4s to Porterbrook Leasing. • Modelling: All the news including more surprise Heljan announcements and details of our next limited edition Hornby model which will take the form of the blue DB Schenker TCT Charity Class 60. We also feature Mike Anson’s superb 1970s Western Region diesel depot modelled to ‘P4’ standards. • News: Franchise shake up sees Arriva grab Cross Country, Stagecoach win in the East Midlands and Govia in the West Midlands. Fastline and Victa Westlink announce new orders for Class 66s. HNRC to run stone trains for Lafarge. • Features: Former EWS boss Ed Burkhardt gives an insider’s view of the past, present and future operations of EWS following the DB takeover. Time Traveller special – 40 years ago DP2 was destroyed in an accident at Thirsk. • Columns: All your favourite monthly reading – Railtours, Traction & Rolling Stock, Unitary Authority, Irish Angle, etc. • Modelling: Nuclear is the theme for this month’s Modeller’s Guide, with photography, formations, and wagon drawings. 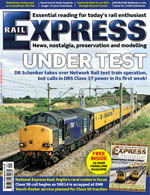 REM reviews Bachmann’s new Class 47, VAA/VBA vans and TEA tanker, while Farish and Dapol ‘N’ items are also covered.